LOOKING FOR SOMETHING FUN TO DO DURING THE SCHOOL HOLIDAYS? Book onto one of our Holiday Projects and take part in creative activities, meet new people and have loads of fun doing it. All holiday projects take place from 10am to 4pm. However, you can drop-off from 9am and pick up as late as 5pm at no extra cost. 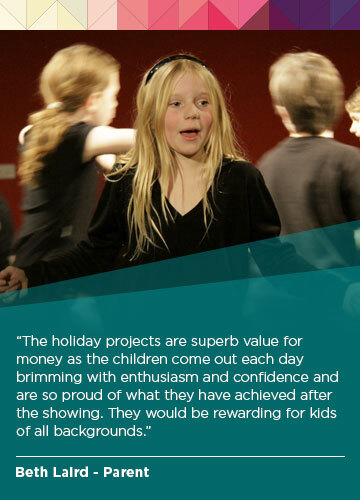 Our Holiday Projects are cheaper than £4.20 per hour! Following 2017s smash-hit success of The Greatest Showman, we escape into the big top to meet the famous ringmaster, Alfred Pennybottom, and his bunch of clowns, tight-rope walkers, lion tamers and much more with this circus inspired Holiday Project adventure. Fun is guaranteed. Get your ticket quick before the circus leaves for its next stop. Ratty, Mole, Badger and the preposterous Mr Toad, have brought delight to many through the years with their odd adventures on and by the river, and at the imposing residence of Toad Hall. Now they invite you to help tell this tale inspired by the classic Kenneth Grahame story. It’s Monday morning and Alex starts a new school. We venture through the modern jungle making new friends, discovering who they are and what they want to be when they grow up. Join us as we rehearse and perform a new musical in a week, with songs from Matilda The Musical, Oliver!, Blood Brothers, Shrek The Muscial and much, much more.